Philippa wanted a rest day, (achy knees – she’s old!) so sent Adam off to do Sa Calobra, which is probably the most (in)famous climb Mallorca has to offer. Adam couldn’t do it two years ago because he had had dental surgery the day before heading out to Mallorca and was not really allowed to push himself (and wasn’t allowed to drink G&Ts either! ), so this would be the chance to do the climb. There’s lots and lots and lots written about the the climb. It’s used by the pros as a training hill (recognise any of those names on the Strava segment?). The road climbs from the fishing village of Sa Calobra, which is at sealevel, up to ~700m. (The sign at the top says 683m, but the Garmin Etrex 20 suggested ~715m). One of the strangest things about Sa Calobra is it’s a dead end road, so the only way to the start of the climb is by starting at the top and riding down the climb and then turning around and riding back up the hill. 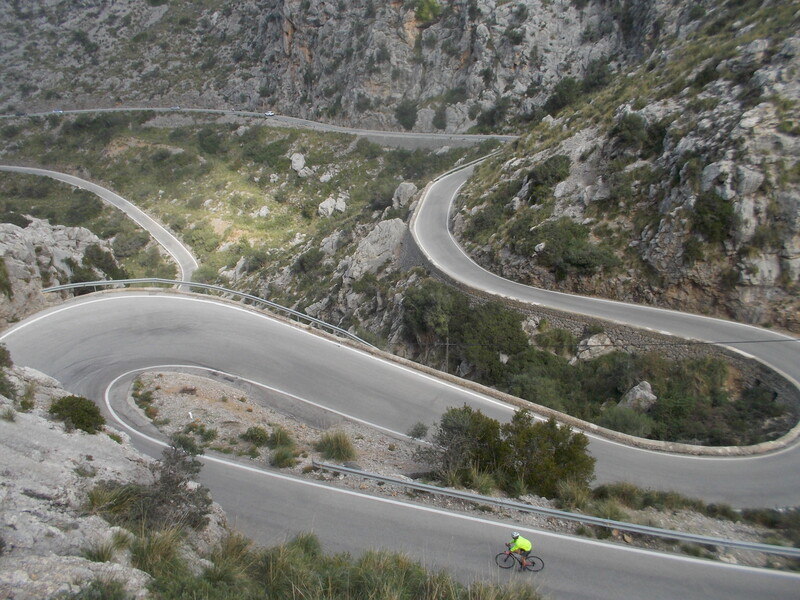 To get to the top of Sa Calobra meant riding from Port de Pollença to the top of the climb. The ascent up the Coll de Femenia follows the Ma10. It’s a gradual climb, which was especially beautiful with the sunshine and views of Puig Major. Once at the top of Coll de Femenia, which is just over 500m, the road bounces along for 15km, passing the beautiful Lluc monastery until the turn off from the main road is reached. From here there is 2½ km until the top of the climb is reached. Then it’s time to drop all that height to the sea, knowing the only way to get back is up the same road. The descent is initially quite twisty, with the road even going underneath itself at one point. The road then straightens out and the rocks close in. Eventually Sa Calobra village is reached. It’s a lovely place, with a few restaurants to get a drink and think, or worry, about what is in store for the ride back up the hill. The climb back up started quite gradually, but there was a steep kick where the road is almost a tunnel thanks to the overhanging rocks, before easing off again. Then at about 500m up the hairpins start. The inside line is steep and best avoided, but this isn’t possible when there are cars coming down the hill. However, the sight of the road twisting over itself means the climb is almost over. But not quite, because the last 80m of ascent are step. There’s always the possibility off a cafe stop before this section. Once the top is reached it’s time to swoosh back down to the main road. However, the ride isn’t yet over because it’s still 35km back to Port de Pollença. Overall this is downhill, but there’s still a number of small ascents before the top of Coll de Femenia is reached. The descent back into Port de Pollença feels quick, although the gradient is never that steep so the speed isn’t crazy. What it does mean is that a lot of the bends are taken without slowing down, making the descent feel fast. From the bottom of the descent it’s still nearly 10km. I buried myself for this final section in the hope my average speed would raise to 24kph. I dunno why; it seemed a good idea at that time!